This is just too cool. 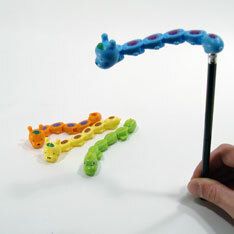 Jointed snake fits over pencil eraser and stays in action as you write. Really, really distracting. Annoying even. We just love this little guy. Snaps together easily if parts become separated. Snakes are 5 inches long. Assorted colors. Sold by the dozen. $3.85 per dozen for 36 dozen or more. $3.35 per dozen for 72 dozen or more.